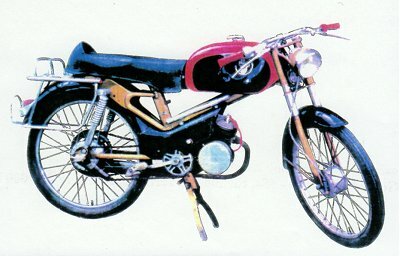 At the 1958 Paris Salon, the famous racing cyclist Jean Robic presented the first Paloma sports moped, the Monza-Miglia. 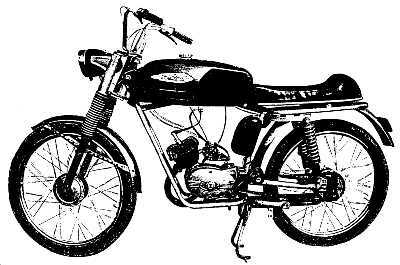 Concocted from a Follis pressed steel frame, a Mottaz fuel tank and a Lavalette AML50 engine with automatic transmission, this moped was a long way from being a success. In parallel, the Saint-Ouen company came forward with several utility and touring models, like the San Provence with a tubular frame and integral suspension. Then, in July 1960 the 'Nouvelle vague' arrived: a series of beautiful machines with Franco Morini engines, the Vesuvio, Strada, Super-Flash. But, in the non-illustrated price list of October 1960, the Monza-Miglia was still listed, but with a tubular frame. Well, here is that rare bird, which could be called the Strada's poor relation. It is simply a San Provence equipped with a Tebaldi fuel tank, a Peripoli saddle and sports handlebars. Suffering from being such a hybrid, the 1961 Monza-Miglia did not sell well; but, to the collector, it represents the 'missing link' in the evolution of the Paloma marque. Thanks to recent discoveries, the confusion that surrounds the Cazenave-Paloma range from 1970 to 1972 dissipates little by little. We already knew that the last true Palomas, derived from the Spécial Johnny, were displayed for the last time at the October 1969 show. Then, at the end of 1972, came the revelation of the 301, 410 and 510: Italian down to the last nut and bolt. The first discovery is the Paloma sports moped pictured here. It was found being shown at a rally and it is in original condition. The main cycle parts: frame, fork, fuel tank, etc ... are the same as those on some Malaguti or Negrini machines. The engine, which is no longer called a Lavalette-Morini but a Franco Morini, carries a plate that says "Cazenave, rèception aux Mines le 03 11 70". Another discovery was a document from September 1972 concerning the revival, following bankruptcy, of Cazenave. The document specifies that the production of cycles, which had been stopped a year before at the Belin factory, would resume. This moped, therefore, represents Cazenave's last tentative attempts to renew its range by using a selection of imported parts.